Tackle your toughest home and auto cleaning projects effectively with this JETSTREAM Pressure Washer JET4800B! 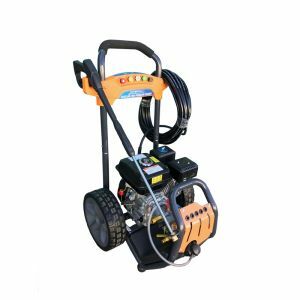 Featuring a 20M hose on a hose reel, a tough, high performance motor and brass head pump, the JetStream JET4800B is built to perform. It provides impressive mobility, compactness and a superior performance. Filled with innovative features and equipped with everything you need to get your job done, ORDER the JET4800B TODAY to have a perfect partner for every cleaning task! 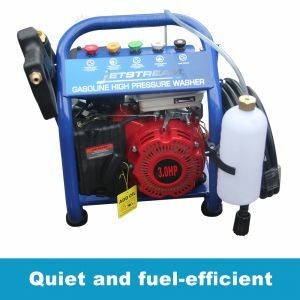 Producing a massive permissible 4800PSI and 10 Litres per minute, this device makes cleaning considerably easier, faster and more efficient. Simply switch to any of the included 5 Quick-Connect Nozzles and you can go from light cleaning to paint stripping or used for a variety of outside tasks such as cleaning backyard patios, decks, driveways, washing down patio furniture, vehicles and much more. It is the perfect tool to rejuvenate and restore worn out or dirty items. 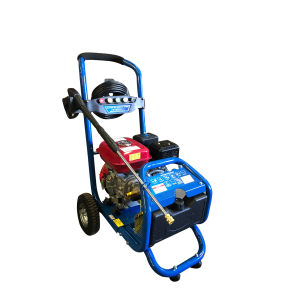 Equipped with a durable powder-coated protective frame, pneumatic wheels and quality brass head pump, JET4800B guarantees a long life of service and can be transported to any job site or moved around with ease. The detergent tank can be replaced quickly and conveniently with just one simple movement to give your cleaning blast a boost!